Single participants in one of the nation’s most popular marriage education programs are likely to strengthen interpersonal relationships, reduce symptoms of distress, and improve social role functioning after nine hours of brief skills training, according to a new study. The study is one of the first comparing the benefits of a short-term, group educational program using a standard assessment most often used to measure the impact of therapy, counseling, and psychiatry. Seth Eisenberg, CEO of PAIRS Foundation, said the study provides important information for policy-makers and the public. “For Veterans returning from combat deployment and other singles, the findings show that skills training is a valid approach to strengthening health, well-being, and resiliency for individuals as well as couples,” Eisenberg said. 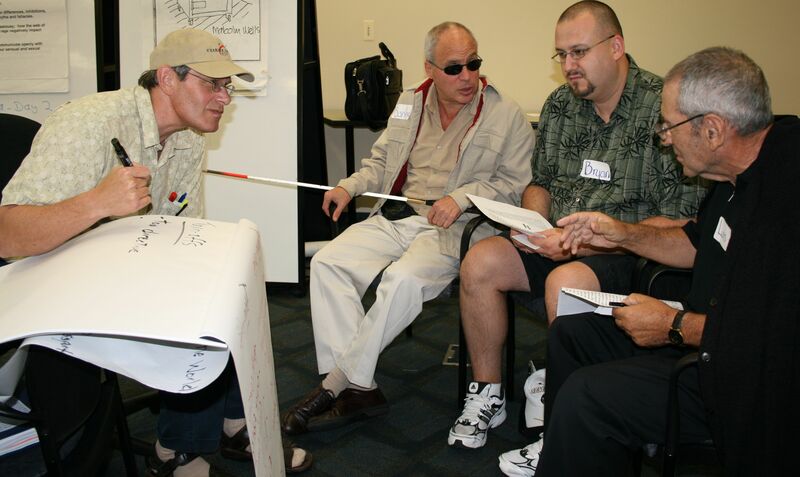 Social Worker Sanford Rosenthal, second from left, has been blind since early adulthood. After PAIRS helped him, he began teaching the classes to other singles to improve emotional understanding and develop greater empathy and compassion for themselves and others. Sanford Rosenthal, a social worker in Fort Lauderdale, said he stopped leading therapy groups and began teaching PAIRS classes six years ago after benefiting personally from the program. “I found the classes were a way of helping people become their own therapists,” Rosenthal said. In providing supportive services to Veteran families in particular, Rosenthal added, skills training is often a safer, more welcome approach. “My experience with singles, especially Veterans, people in recovery, and low-income participants, showed that their problems were only rarely about mental illness. More often, it’s because they didn’t have skills to understand their feelings, communicate with people they lived and worked with, and find their own solutions,” he said. “Classes help singles have more compassion for themselves and others along with usable skills to overcome challenges,” Rosenthal added. The study was conducted using an outcome questionnaire known as the OQ-45.2. The assessment is a 45-item self-report scale designed to track and measure client progress in psychotherapy. In collaboration with a research team led by Dr. Andrew Daire of the University of Central Florida’s Marriage and Family Research Institute, PAIRS began administering the scale in 2007 to understand the benefits singles received from short-term, group education based on emotional and social learning. The scale is designed specifically with the purpose of being repeatedly administered, providing an assessment of progress, deterioration, or no change. “The items address common symptoms and problems (mostly depressive and anxiety-based) that occur across the most frequently occurring psychiatric disorders,” Dr. Peluso noted. For the study, Dr. Peluso analyzed pre/post assessments from 125 participants who completed a nine-hour PAIRS Essentials class. “Paired samples t-tests revealed that the post-test scores were significantly lower from pre-test scores on the total scale t (125) = 3.70, p. < .001, the symptom distress subscale t (125) = 4.34, p. < .001, the interpersonal relations subscale t (125) = 2.49, p. < .001, and the social role subscale t (125) = 2.89, p. < .001. This provided evidence that the PAIRS program had a beneficial impact on participants,” Dr. Peluso reported. “For individuals who were above the clinical threshold for Social Roles, the total scale, social roles and symptom distress scales were significantly lower. For individuals who were above the clinical threshold for Symptom Distress, the total scale, social roles and symptom distress scales were also significantly lower,” he found. Eisenberg hopes insurance companies, health care providers, and policy makers struggling to balance state and federal budgets will consider the findings. “Billions are spent each year diagnosing, treating and often medicating people. For many, this type of skills training could prevent or reduce the need for expensive, long-term care,” he said.